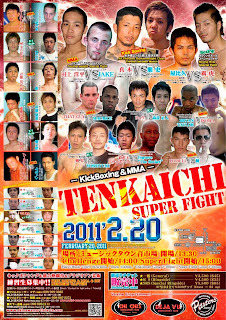 The next Tenkaichi Super Fight is going to be February 20th 2011!! This is our first fight of the year so we are kicking things off with a Kickboxing Title Match. There were 2 title matches but unfortunately one of the opponents injured themselves in training, but no worries the undercard is pretty stacked as well. Tickets are on sale now here at Tenkaichi Dojo as well as at Wild Seasar Koza and Naha gyms.